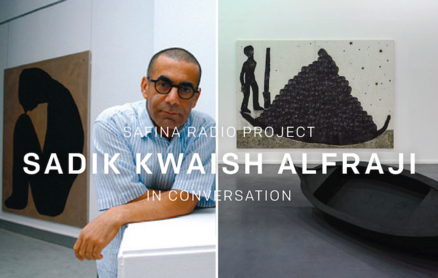 Please join Sadik Kwaish Alfraji in conversation with Wael Hattar on Tuesday, 28 April at 7pm, at A4 Space in Alserkal Avenue. The first public talk for the Alserkal Avenue's Safina Radio Project, the talk takes Alfraji's current exhibition 'Driven by Storms (Ali's Boat)', as a starting point to discuss concerns of diaspora and displacement. Commissioned by Alserkal Avenue and curated by Anabelle de Gersigny, the Safina Radio Project is an itinerant space, a boat transformed into a recording studio that navigates the waterways of Venice, transporting passengers from one place to another, acting as a roving platform for expeditions and crossings. The artist talk is free and open to all.